Saint Andrews Day in Romania always falls on November 30th each year and celebrates the patron saint of Romania. People will take the day to spend with family and friends and relax. Some old traditions include bringing out garlic to scare off ghosts and eating a type of salty bread and hope of dreaming of the person they will eventually marry. This is a national holiday with government and business offices closed. 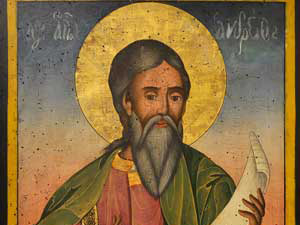 Saint Andrew was one of Jesus's apostle's and the brother of Saint Peter and the patron saint of Romania. St Andrew travelled to Greece and converted a proconsuls wife to Christianity and was tied to a cross where he died from lack of water and starvation.